This "Historically Speaking" column appeared in the Exeter News-Letter on January 13, 2017. One of the wonders of strolling through a cemetery is encountering grave markers that tell a story. Most are quite sad, as death tends to be when a person dies young or a family suffers a quick succession of deaths. Some are final tributes to a long life well-lived. Occasionally, a grave marker hints at both a tragedy and a tribute. Such is the puzzling grave of Nathan Burnham in the Winter Street Cemetery. The grave stone reads, “This stone is erected by the scholars of the town school in Exeter, as a token of respect for their beloved instructor, Nathan Burnham, who died April 2nd, 1821, Aged 21 Years. Go, fair example of untainted youth. Of mildest wisdom and pacific truth. Go live, for Heaven’s eternal year is thine. Go and exalt thy mortal to divine.” The verse was written by Alexander Pope in 1726. 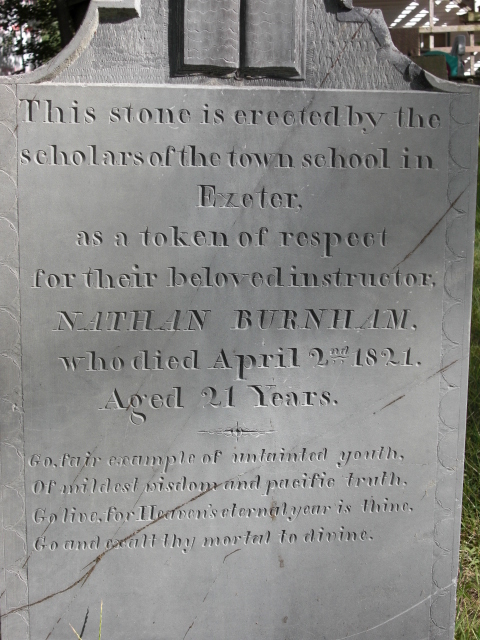 By the early 1800’s it had become a popular epitaph for young men, but did it apply to Exeter’s Nathan Burnham? Was he a “fair example of untainted youth, of mildest wisdom and pacific truth?” And why was his grave marker erected by his students instead of his family? Usually, when presented with this kind of mystery, we can look at a death certificate, which will generally list the deceased’s parents, place of birth and cause of death. But Nathan Burnham turns out to be more mysterious than anticipated. His death certificate provides no more details than his grave marker. He is listed as “assistant schoolmaster, age 22” but with no other identifying information. If he was 21 or 22 years old, he must have been born in either 1799 or 1800. A quick run through the genealogical search engines finds a Nathan Burnham born in 1799 in Corinth, Maine – but Corinth’s online records do not verify this. There doesn’t seem to have been a Burnham family in Corinth at all. So, maybe he was born in Maine, but maybe not. He definitely wasn’t born in Exeter. There were no Burnhams in Exeter at that time either. His passing was noted in the local newspaper, the Northern Republican. Of Nathan Burnham the paper said, “This amiable young man, though but recently a resident of this town, had, by his modest and religious deportment, secured the affections of a numerous and bereaved acquaintance. During the short, but severe sickness that preceded his dissolution, he often expressed a longing desire to be at home with his Saviour.” After the funeral, presided over by the Rev. Rowland, “his remains were attended from the meeting-house, to the place of interment, by a large and solemn concourse of people,” which no doubt included his students. It’s not a lot of information to go by, but it does seem that Nathan Burnham was cherished and his reported personality reflected the poetry on his grave marker. And perhaps he had “secured the affections” of a couple named Robert and Margery Rogers. Two weeks after the young schoolmaster’s death, Margery gave birth to a boy who was named Nathan Burnham Rogers and the story continues. The Rogers family remained in town for a few more years. The next time we hear of Nathan Burnham Rogers was upon his graduation from Dartmouth College in 1845. Pious like his namesake, Rogers went on to the Theological Seminary in Andover and was ordained as a Congregational minister on December 6, 1848. He was called to serve at the South Congregational Church in Hallowell, Maine. It seemed that his life was a continuation of his namesake – perhaps the first Nathan Burnham would have gone into the ministry. In October of 1849 Rogers travelled to Hopkinton, New Hampshire to marry Lydia Bailey. The two were wed on October 9th and set off together on their honeymoon. On November 11th, the Exeter News-Letter sadly reported the sudden death of Nathan Burnham Rogers. “In Hallowell, Maine, of typhoid fever, Rev. Nathan Rogers, age 28. He was married about three weeks since, and was seized with the fatal disease the night of his return from his bridal journey.” The bereaved parishioners of Hallowell’s South Church buried him in their cemetery. One grave marker in our cemetery ultimately tells the tragic stories of two gentle and kind men. We may not know about the origins or family (if there was any family) of the first Nathan Burnham, but we know his students loved him. Nathan Burnham Rogers, like his namesake, had a promising future of service waiting for him. He too, was loved. We need more monuments reminding us about love, even when tinged with sorrow. Photo: Winter Street Cemetery grave of Nathan Burnham, an assistant schoolmaster who died at the age of 21 in 1821. His bereaved students erected his grave marker. The photo was taken by Clair Cushman for Find-A-Grave and used by permission.